To celebrate Coventry’s bid for the City of Culture in 2017 Dr Emma Parfitt, Sociology Researcher at the University of Warwick and Fargo village are bringing 17 artists and academics together for an exhibition of local artists’ work that aims to bridge the art-science divide. Artist-researcher collaborations have resulted in pieces of work that will be exhibited for one day only, on Saturday 26 November 10am-6pm at the Fargo Village Box Gallery. A collection of Warwickshire artists were given the challenge to communicate research in creative ways. On display will be unique and visually stunning hand crafted jewellery, photography, sculpture, charcoal sketches, models, paintings, 2D and 3D drawings, illustrations, stained glass, and more created by local artists to help communicate cutting edge research to a wider audience. Visitors will be given the opportunity to vote for their favourite collaboration, and be able to chat to the researchers and the artists about what they think of the work. The event is family friendly, even offering free yoga sessions at 3pm and 4pm. Visitors will also have the chance to purchase the artists’ work thereby supporting local art and culture. Dr Emma Parfitt who created and organised the event said: "I am a storytelling researcher so I am always thinking of new ways to communicate that research to people. The basic idea was that knowledge, like art, should be accessible to all. We call it an exhibition, but it is really an event crafted for people that may not have been in a traditional exhibition space before and are not sure whether it is for them or not. Of course, I hope that people who enjoy art already will also find the idea one that they would like to explore." "This exciting exhibition is a chance to bring people together with the aim of closing the art-science divide. It opens the academic world to the community, from an internationally diverse set of students and subjects." 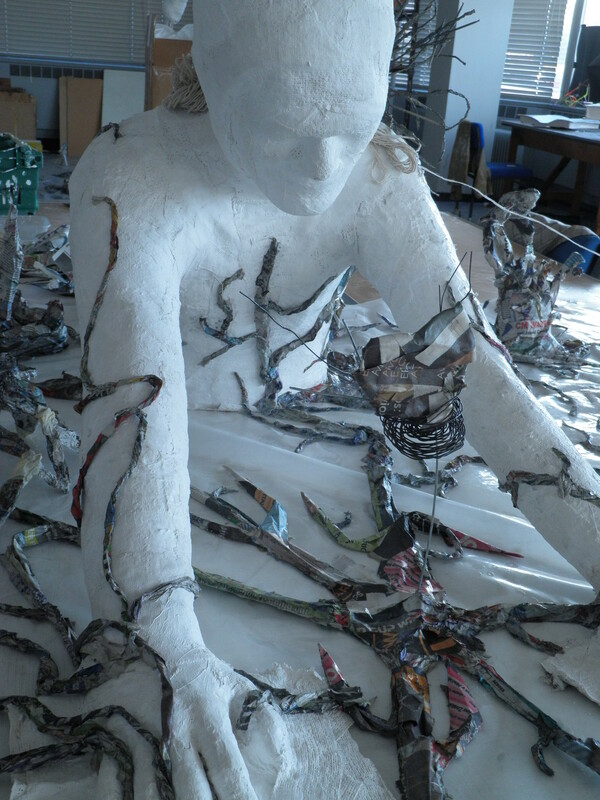 Visitors to the exhibition will experience a centre piece sculpture entitled ‘Twixt Nature and Nurture’ influenced by Rebecca Noble’s research into madness and by artists Francisco Goya and Hieronymus Bosch. This piece of work will measure 6m long x 2m wide x 2.5-3.0m high and will be made predominantly of paper. Rebecca Noble PhD Researcher in the Centre for History of Medicine at the University of Warwick said: "Arty Folks has made a fantastic exhibition piece in response to my work on madness in eighteenth-century Mexico. The artwork is the result of creative conversations about mental health inspired by the past and I hope it will be thought provoking for others." This event has been supported by the Sociology Department and the Institute of Advanced Study, at Warwick University. This exhibition has also been made possible by the generosity of Warwick Alumni.